Few places conjure up images of fab tans, luxury and romantic baecations like the Maldives. You’ve seen the images in magazines and on Instagram filled with turquoise blue waters, decadent overwater villas and pearlescent beaches. The Maldives is the daydream worthy spot on every travelers bucket list. But how do you even begin to plan a trip to the Maldives? Have no fear! 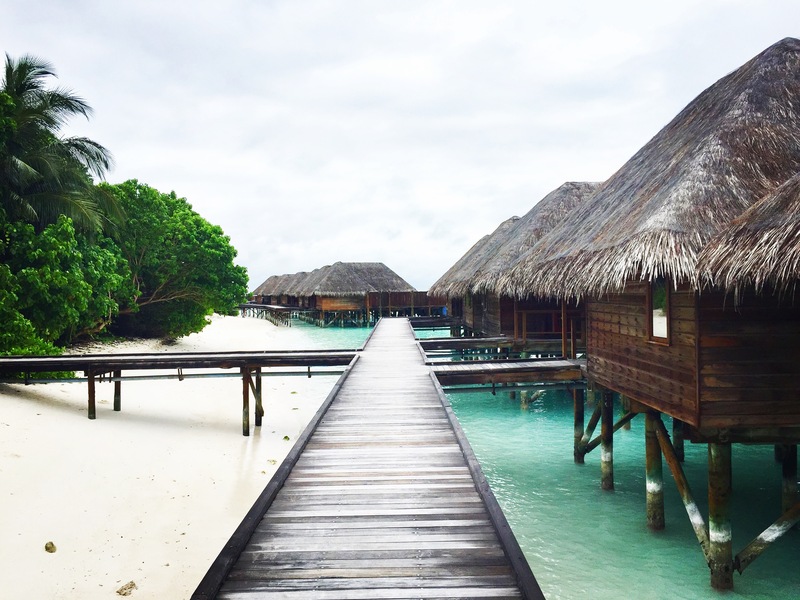 I recently went to the Maldives on an epic luxe getaway where I learned a thing or two. Is not easy, and can be an expensive headache, but it’s totally doable. So grab a pen and a pad, because I’m here to help you start planning the trip of a lifetime to the destination of your dreams. The Maldives is a South Asian island located in the Indian Ocean. It comprises of 26 natural atolls consisting of dual island chains, and is located on top of a vast underwater mountain range with around 1190 islands and sandbanks. The Maldives has no counterpart in terms of its unique geography and is home to the most diverse marine treasures in the world. The heart of the Maldives, the capital city of Malé (pronounced Mar-lay) is a stark contrast to what you see in the magazines. Malé offers visitors to see the real Maldives and explore its bustling streets, markets, mosques and more. The local currency is Rufiyaa (MVR) and while credit cards are accepted in many shops, having a few local dollars on hand never hurts. The best time to visit the Maldives would be December through February, unfortunately it is also high season which means rates at hotels can get sky high. Shoulder season is generally March and April when the temperatures are at their highest. Low season, May through November, is rainy season in the Maldives, but it is possible to still go and enjoy great weather if you go in mid to late November when rainy season is ending and lodging prices are still fairly low. For the most part, visitors to the Maldives do not require visas for stays of 30 days or less. Check visa requirements for your specific passport before your travel. One of the main things you need to do before you plan a trip to the Maldives is get real about your life and your finances. There’s a reason why the Maldives is a dream destination, and that’s because it can get pricey! Sure there are ways to go to the Maldives on the low low – like staying in cheap hotels on Maafushi island that can be as low as $80/night and then spending $100 to take an all-inclusive day trip to a nice resort. But if you’re trying to do it the way you’ve day dreamed about, be ready to come up off some coins because that daydream is not for the broke. Rates at the nicer resorts can cost into the thousands per night, and even the low end can be at least $500. None of this includes taxes, fees or food and beverage. Getting to these resorts is another cost. Since each resort is on its own island, the only way to get to them is by speedboat or seaplane, which can cost around $300 and up per person. There are no glitches or deals to be found in this area. Trans Maldivian Airways provides seaplane service to all resorts, so unless you own your own plane, they are who you fly with. The resorts should have their own speedboats, so that’s pretty non-negotiable as well. Basically, if you’re trying to be about that resort life, be prepared to pay. Don’t worry about arranging the transportation, the hotel typically takes care of this for you. Also, the Maldives is a Muslim country, and adheres to a strict no alcohol policy. It is illegal to bring alcohol into the country, even in your checked luggage, and there is no duty free at the airport. Your only options are to partake in a booze cruise that floats off shore near Maafushi or to cough up money on pricey drinks at the resorts. Since island hopping is difficult between resorts due to the need for seaplanes and speedboats, chances are if you’re trying to drink you will need to purchase some kind of drink package at your resort or pay per drink. The day trips from the cheap hotels I mentioned earlier are a good way to get your unlimited drink on. But again, if you’re trying to live out your dreams, pricey resort drinks it is for you. The Maldives isn’t going anywhere any time soon, so take all the time you need to save and plan for the trip you desire. Travel is not a race, it’s a journey, and even if it takes you a little longer than most to save up, it will be worth it when you get there. The main airport in the Maldives is Ibrahim Nasir International Airport (MLE). Though there are no direct flights to the Maldives from the U.S., most, if not all, major airlines fly to the Maldives with at least one stop. For my own trip I found flights leaving from JFK in November for just over $800 roundtrip. Deal sites like The Flight Deal, Secret Flying and Airfarewatchdog sometimes have flight deals for less, you just have to keep an eye out. If you have time and money, and want to make the most out of your trip, consider extending your layover. My flight had a stop in Dubai for a few hours on the straight roundtrip ticket. Instead, I booked a multi-city ticket which allowed me to stay in Dubai for three nights before heading to the Maldives, and it cost me the same as a regular roundtrip, so I got a flight to two countries for the price of one. Extending a layover can also be a great way to ease out of jet lag. The time difference between Dubai and Male is only one hour, which means a few nights in Dubai can help get your body acclimated to the time change so when you arrive in the Maldives, you don’t spend your first few days extremely tired. The resorts in the Maldives are to die for and choosing just one can seem nearly impossible. If you have the disposable income, you can certainly spend a few nights at one resort before hopping over to another (Which is what I did. I stayed at three properties including Soneva Jani and Soneva Fushi), but if you’re looking for one resort that will give you the experience you’ve longed for, then the Conrad Maldives Rangali Island is it. Reached by a scenic 30 minute seaplane flight, the Conrad Maldives offers three different experiences on two islands. Discover a Maldivian hideaway on tiny Rangali Island or cross the bridge to enjoy the livelier main island. The third experience – the Spa Retreat – is an over-water destination set off the main island. The Conrad Maldives is exactly what you’ve lusted over in all those pictures and offers luxurious villas, including romantic water villas on Rangali Island, contemporary beach villas amidst tropical greenery on the main island, or stunning over-water villas at the Spa Retreat. There are also 12 restaurants and bars that cater to every palette, two spas, two pools and unique experiences such as manta-watching, dolphin-spotting and snorkeling with whale sharks. I chose the Conrad for my own trip to the Maldives recently and I can tell you that you will not be disappointed. The staff is extremely attentive and goes above and beyond to make sure you enjoy your stay, the food was amazing, the activities were endless (they even have karaoke!) and even with all the other guests, the Conrad somehow still manages to make you feel like you have the resort all to yourself. One of my favorite experiences at the Conrad was enjoying a champagne breakfast at their world famous Ithaa Undersea Restaurant. Pictures of Ithaa are probably #1 when you search for images of the Maldives and it is definitely an item on most travelers’ bucket list. The Maldives isn’t exactly somewhere you go to do a lot of stuff. If you’re into diving, crossing off bucket list items like swimming with whale sharks and manta rays, snorkeling, jet skiing, taking cooking classes, tanning and sunset cruises, then the Maldives is for you. The only other activities would be exploring the cultural side of the country back on Malé, so definitely add a night or two on the main island to the front or backend of your trip. This island paradise is everything you’ve imagined it to be. The long flights, the tiny sea plane and the screaming wallet are all worth it once you touch down. The Maldives are the ultimate luxe destination, and now, you’re on your way to experiencing the dream.